I have been a fanatical season member of the Docker's since they were formed in 1994, and have continued (and will continue) to support them despite a relatively disappointing season (excluding the North Melbourne and Adelaide wins), which can probably be attributed to a shocking injury list. Despite an average season, players like Brad Dodd have given me and other Fremantle supporters a lot to look forward to in the future - what more can you ask for from a player than a never-say-die attitude, a selfless playing style, excellent skills and great decision making (excluding the striking report of course - when I watched the game (a shocking loss to Richmond) I felt like hitting someone too). Brad Dodd is all this and more - he's a real Docker and I wish our team had more of him. Following a shocking loss to North Melbourne, Fremantle coach Gerard Neesham was sacked. Although he has (incredibly) agreed to coach out the remaining games, our season is long gone and after an embaressing loss on the 23rd of August to Port Adelaide at Subiaco Oval (Show some heart, Dockers, would you?) I personally can't wait until the season has completed. Since his return, Brad hasn't had the same sort of influence as he did before his suspension. I think of it as a 'reality check' and am not at all worried. 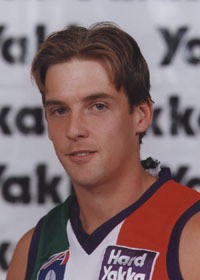 He'll be back even better for season '99, and hopefully, so will the Dockers. One of the finds of the year early who has hit the wall in recent weeks. Averaging 14 possessions per game and has kicked 9 goals as a midfielder and tagger. This Celebrity Page was made by Tripod member tisca.